A smaller size cheesecake, made in a loaf pan, and without the need of a water bath. 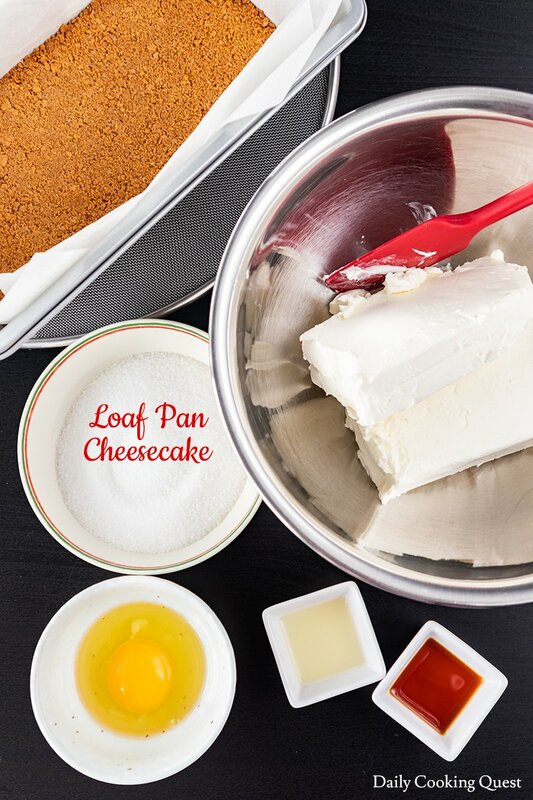 This loaf pan cheesecake recipe is for when you need a smaller size cheesecake, made with a regular loaf pan, and without the need of a water bath. If you have never made a cheesecake before, this is a great introduction recipe. Also equally great for people who seldom make a cheesecake since you don’t need to buy a springform pan. Most cheesecake recipes in United States use graham crackers for its crust. It’s basically digestive cookies. It may be called with a different name in different country. For example, I know that in Indonesia, our digestive cookies is Marie Biscuit. If you are in United States and don’t want to weigh, you need about 8 sleeves to get about 135 gram of cookies. If you use anything other than graham crackers, the best way is to weigh your cookies. To make the crumbs, you either place all the cookies in a ziplock bag and crush with a rolling pin. Or, you can use your food processor to pulse into fine crumbs. There are two kinds of cream cheese you can buy in the market, the regular full falt cream cheese (probably just called cream cheese), and the 1⁄3 less fat cream cheese. Maybe I am a traditionalist when it comes to cheesecake, but I like to use the full falt cream cheese, though most said they cannot detect the difference in taste. So it is up to you to choose whichever one to use. If you are undecided, you can try using 1 block of regular full falt cream cheese, and another 1 block of the 1⁄3 less fat cream cheese. The most familiar toppings for cheesecake is probably some sort of berries, with strawberries and bluberries topping the chart (most likely). Since I still have plenty of leftover cranberries sauce from my Christmas dinner, I didn’t have to specially make a fresh batch of berries compote/sauce to go with my creamcheese. One slice of this cheesecake topped with 1 tablespoonful of cranberries sauce, and I am in cheesecake heaven. :) If you don’t want to make berries compote, you can just pair with fresh berries of your choice and it will be equally delicious. Preheat oven to 325 Fahrenheit (165 Celsius). 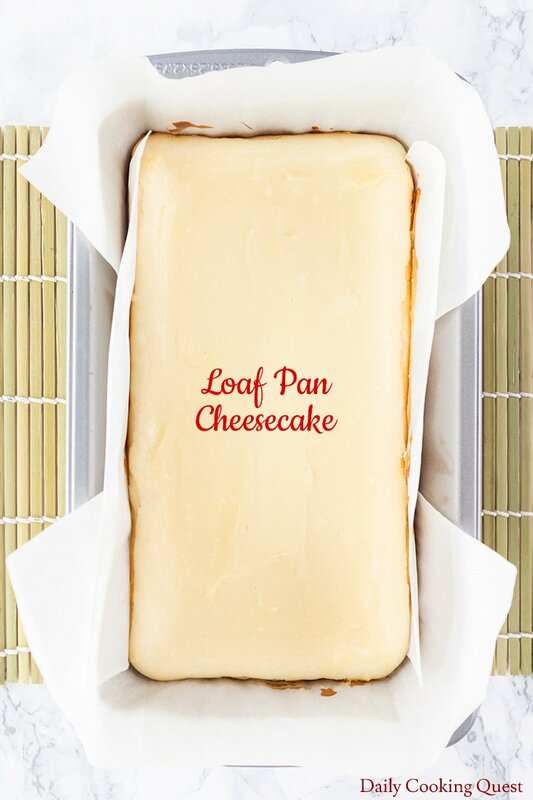 Line a 9"x5" loaf pan with parchment paper with enough overhang to easily remove the cheesecake from the pan. Mix together all the crust ingredients, then pour into the prepared loaf pan. Press down the crust with the help of a spatula so it is tight and firm. 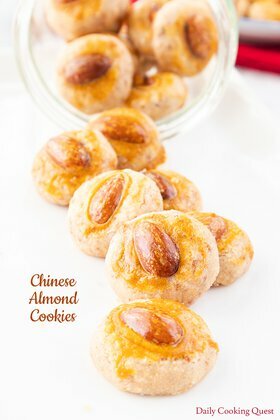 Bake in the preheated oven for 23-25 minutes, or until the edges and top are golden brown. Meanwhile, let's make the cheesecake filling. With a mixer, beat cheesecake until completely smooth. Add in sugar, egg, vanilla, and lemon juice. Beat until completely mixed and smooth. Pour the cheesecake filling on top of the warm crust, smooth the top. Bake in the oven for 40-45 minutes, or until the cheesecake is set. A cake tester should come out only almost clean, not completely clean. Remove the pan from oven, and place on a wire rack. Once cool, refrigerate the cheesecake for at least 4 hours, overnight is best. 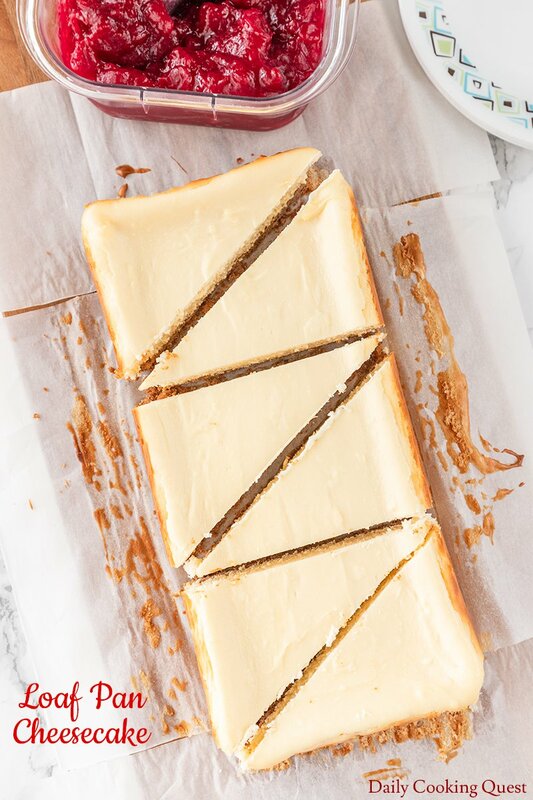 Remove the cheesecake from the pan by grabbing the overhang parchment paper. Slice into 6 servings. Serve plain, or with your toppings of choice. (*) I use my leftover cranberries sauce from Christmas dinner. It is super easy to make, simply simmer together 12 oz. fresh cranberries, zest and juice from 1 fresh orange, and enough sugar to your taste (about 1/4-1/3 cup is usually enough). Once the berries are almost mushy and the sauce is thick, it is done. 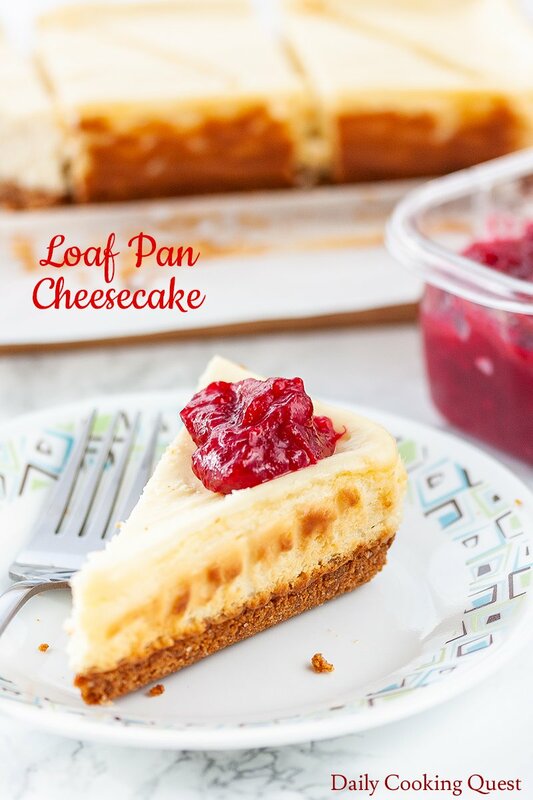 What a great idea to use a loaf pan to make cheesecake! I've never thought of it before, and I can see from your photo that it turned out great. Thank you Sophie. 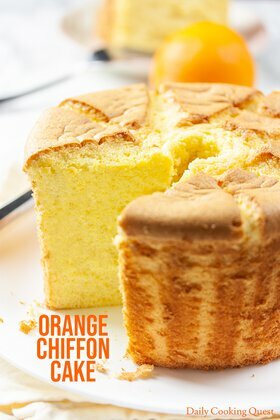 It is indeed a surprise for me too when I found out that cheesecake can be baked in a loaf pan, and best of all, no need for a steam bath. Indeed, I love how I don't need a water bath for this loaf pan cheesecake. This makes the perfect amount of cheesecake! Thanks so much for sharing! Totally. I think a smaller size cheesecake like this is perfect for weekdays, and only bake regular size version when I have guests coming. What a genius idea to make a cheesecake in a loaf pan. I love this idea. 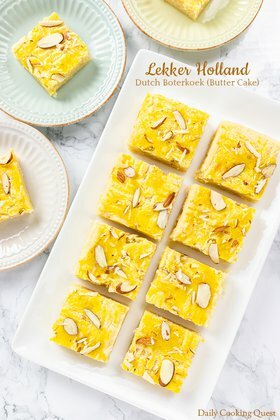 Those photos looks so tempting and I could just reach through the screen with a fork and take a bite! Fabulous idea to use your loaf pan! Def want to try this. Your cheese cake looks great. Going to pin for later! I simply love this idea and will be using it soon! I make my sour cream coffee cake in a loaf pan too and I think it really sets it apart from other cake recipes.